We recently signed up for yet another locally-sourced subscription food service providing awesomely fresh foods from the immediate area — in this case, a community-supported fishery, which is basically exactly what it sounds like, that is, a CSA with fish instead of produce. We get about a pound each of two different seafood products every week. This week we picked up shrimp and sea scallops. Tonight we needed a quick dinner, so we decided to try out one of the recipes suggested in the CSF newsletter: cumin scallops. The recipe that the CSF folks shared came from my acquaintance Chef Shirlé, who, unlike me, is a proper (and super-talented) professional chef. Also, top-notch vocalist for rockers Free Electric State (currently) and countless other bands (formerly). Anyway, her recipe for cumin scallops is really just a riff on sautéed scallops, but the results are outstanding — and fast! Full disclosure: I played fast and loose with Shirlé’s recipe, so if you want to do this recipe up proper, this may not be the best model. Though it turned out okay for me. 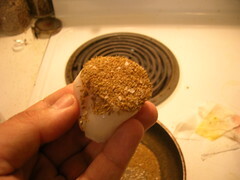 The first step is to grind up some toasted cumin seed, which will be the basis for the scallop seasoning. 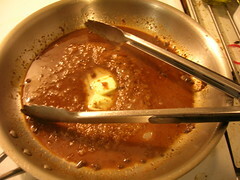 The toasting step is important since it gets various volatile oils moving in the cumin and really enhances flavor. 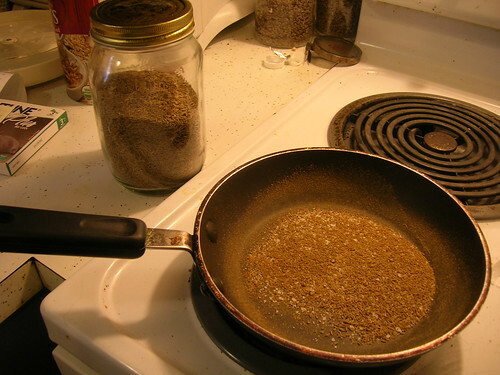 Normally I would toast and then grind, but because I was a bit hasty in my preparation today, I wasn’t thinking and I ground the cumin first. So I just toasted the resulting powder, which seemed to work decently well. 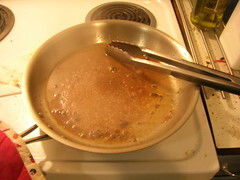 It’s pictured below in the small skillet. This actually worked okay, because it meant I could use the skillet to hold the seasoning while I coated the scallops, rather than dirty a pie plate or something. Also, now would be a good time to preheat the oven to 375 degrees Fahrenheit — we’ll be using a hybrid sauté/bake technique to ensure proper cooking. 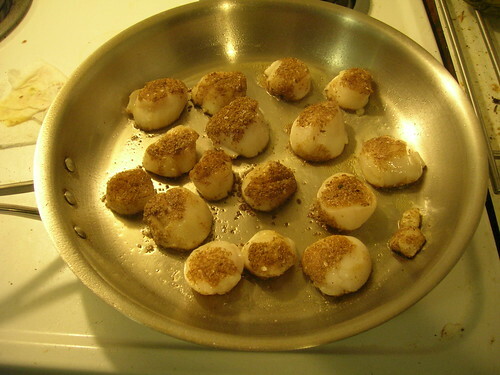 Once everything was ground up, I added some salt and pepper to the cumin and then dipped the top and bottom of the scallops into the mixture and set aside. 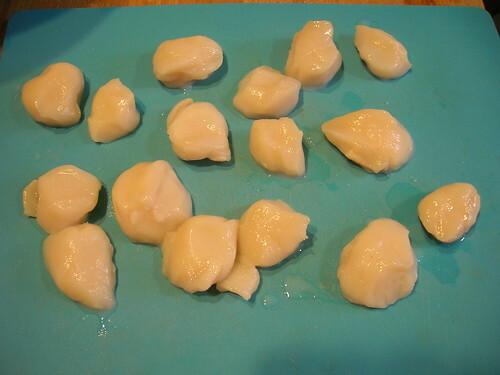 The scallops cook for two minutes on each side. 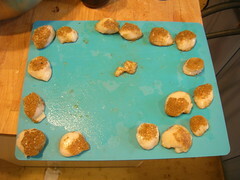 As you can see below, though, I had a bit of trouble with the spice coating coming off about half the scallops. I suspect this is because my stove isn’t level and all of the oil pools to one side–the scallops in the “deep end” had a nicer crust on them than the others. But this turned out to be OK, as we’ll see later. 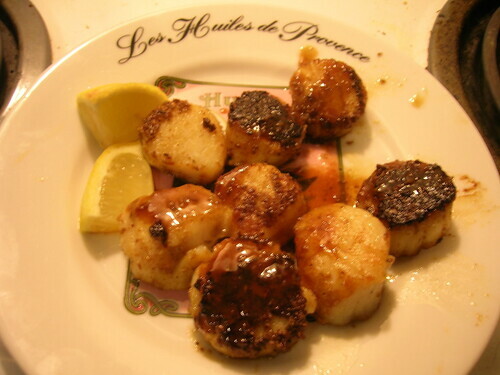 But one man’s under-crusted scallops is another man’s sauce base. I thought I would take advantage of my misfortune and go for a little sauce action. 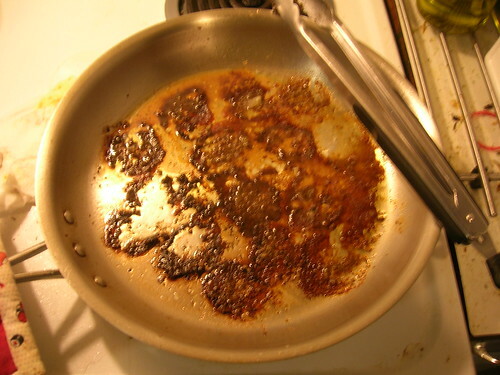 I tossed in a little lemon juice and white wine and scraped the pan until the cumin scab had dissolved into the liquid and the mixture had evaporated a bit, then I whisked in some butter. Ta-da! instant sauce! It made for a piquant and flavorful counterpoint to the clean, sweet taste of the scallops. Would that more of my cooking mishaps turned out so well. 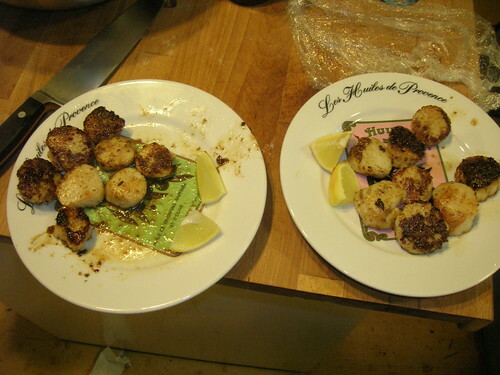 All in all, the whole cooking process, from grinding the cumin to dredging and cooking the scallops to whisking up the sauce took maybe 25 minutes tops. If I’d been a little more organized and equipped (I had to hand-grind the cumin in a mortar and pestle due to an equipment failure) I bet it could be done in 15 minutes flat. Talk about a quick–and delicious–meal! 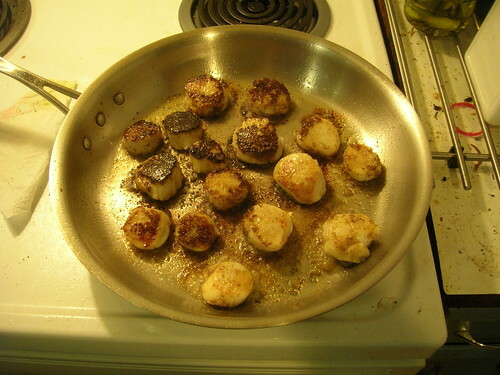 I love cumin and I love scallops and I have never ever thought of the two together. I will definitely try this . Your photos are great. Thanks for sharing. I’m coming to the realization that cumin is maybe underutilized. Our local Szechuan place serves a dish called Cumin Lamb which is basically sliced lamb with buckets of cumin and some hot peppers. It’s unspeakably delicious.